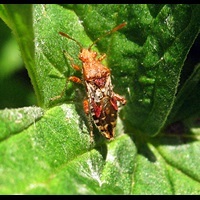 Rhopalus subrufus is a small, but colourful and striking bug. 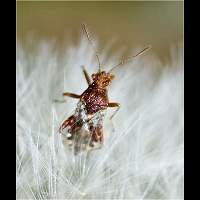 The head, thorax and legs are orange brown, The shield and the tips of the front wings are red. The first part of the front wing is white, but transparent. The hind wings are completely transparent, showing the animal's white striped black abdomen. 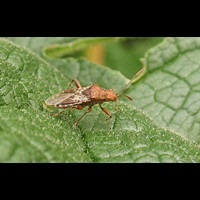 The animal measures some 7 to 7.5 mm. 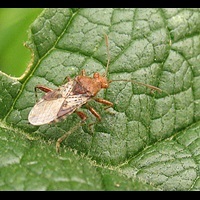 The antennes are slightly club shaped, brown and measure 4 mm. The entire bug is hairy. 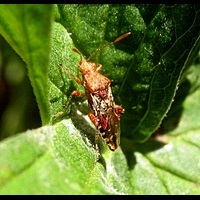 Rhopalus subrufus overwinters while adult. But adults are long lived so they appear among the larvae. Fresh adults are seen in August mainly. This species may survive on quite a number of plants, but it favours St. John's Wort, Herb Robert and Wild Basil. Common in England, Wales and Ireland, uncommon in Scotland and absent in Northern Scotland. Lives all over Europe (except for Northern Scandinavia), Asia and Northern America. This page has last been modified on Friday, April 28, 2017.